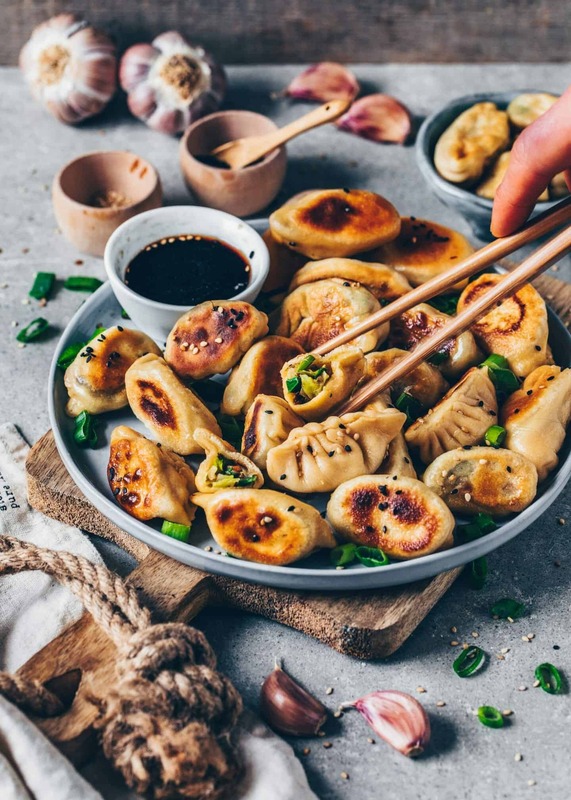 Crispy pan-fried Vegan Gyoza (Jiaozi) are Japanese Vegetable Dumplings, also called Potstickers. 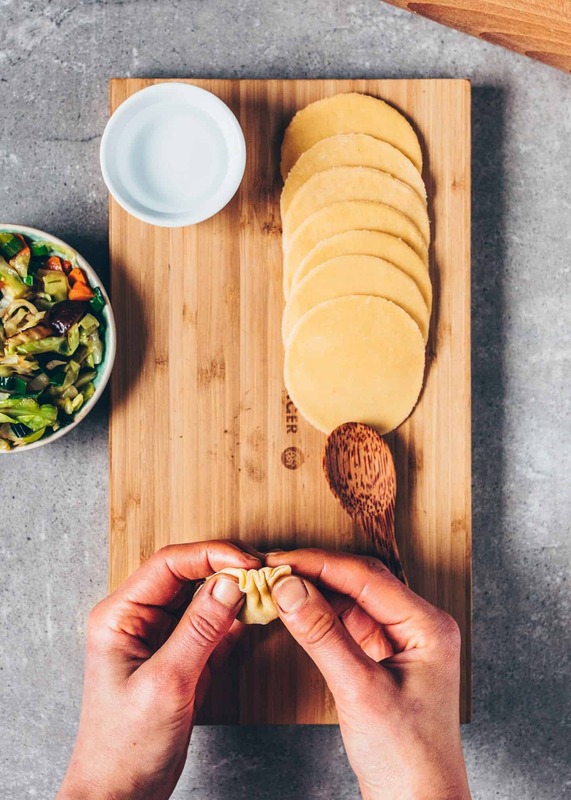 They’re made of simple Homemade Dumpling Wrappers and filled with healthy veggies. This recipe is fairly easy and includes step-by-step instructions. 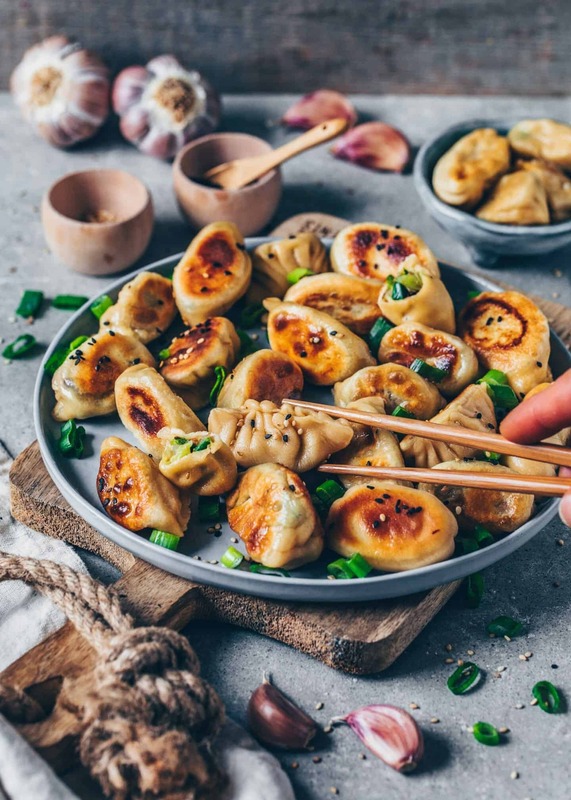 If you’re like me, you can never have enough delicious Vegetable Dumplings. To be honest, I could eat them every day and never get tired of them. Actually, all types of Dumplings are pretty similar, but to me, it makes a huge difference which kind you make. 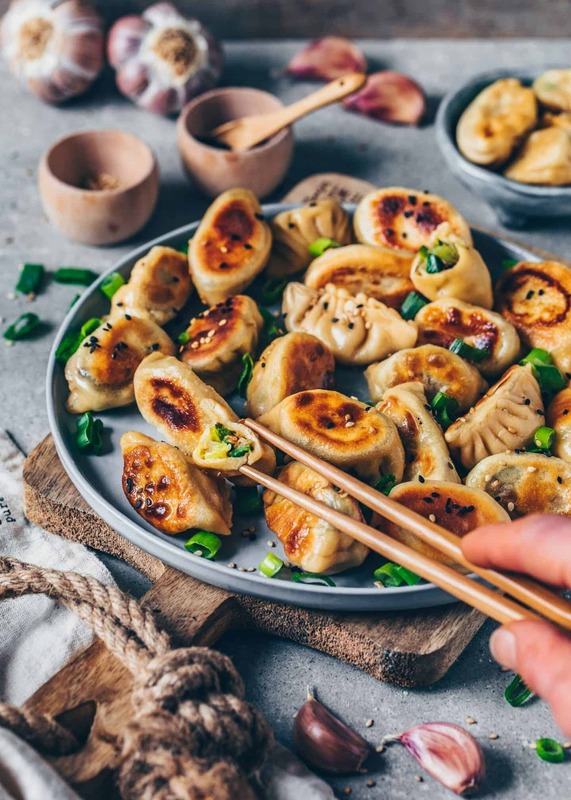 There are Ravioli, which are well known in German cuisine, Pierogi from the Polish and Russian cuisine, and Gyoza (Jiaozi) which are often served in Japanese and Chinese cuisine. However, there are also many more I haven’t tried yet, such as Wontons, but I definitely will soon! 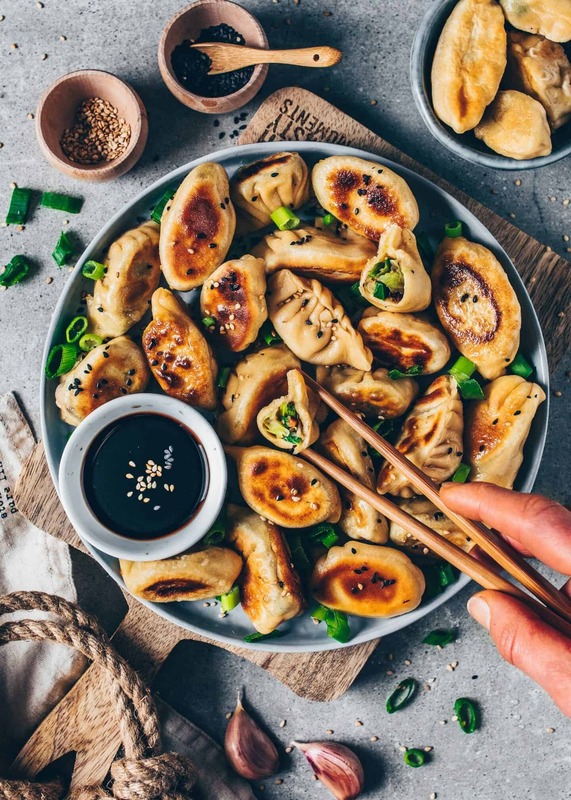 Vegan Gyoza is one of my all-time favorite foods to eat when I’m in a Japanese or Chinese restaurant. 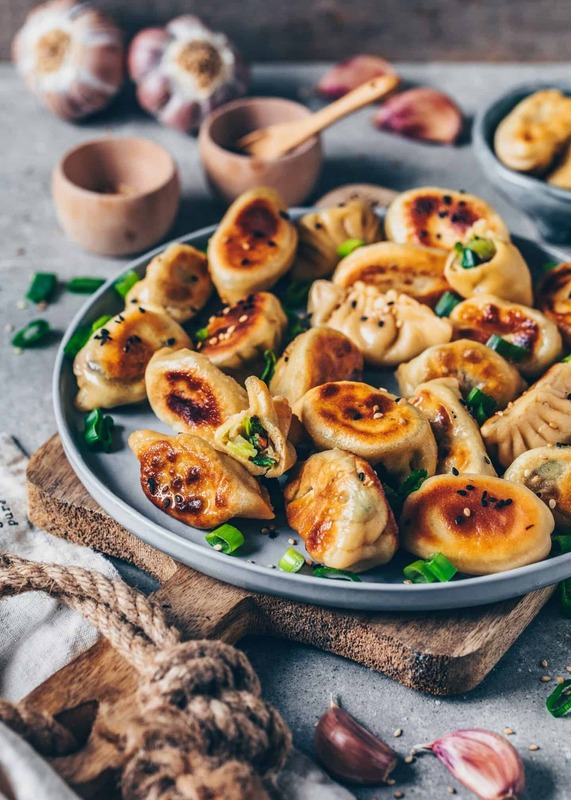 These Potstickers are usually served steamed with a crispy bottom and filled with healthy vegetables. Sometimes they’re also filled with meat, but in my version, there is no meat, so it’s cruelty and meat-free! To be honest, I‘m not a Vegan Gyoza Wrapping expert, but I‘m a huge Ravioli lover, which to me are easier to prepare. Anyways, I love making these little Crispy Japanese Potstickers, so I would like to share with you how I make these simple Homemade Dumpling Wrappers and to inspire you to try it, and give you the knowledge about how to fold Vegan Gyoza. 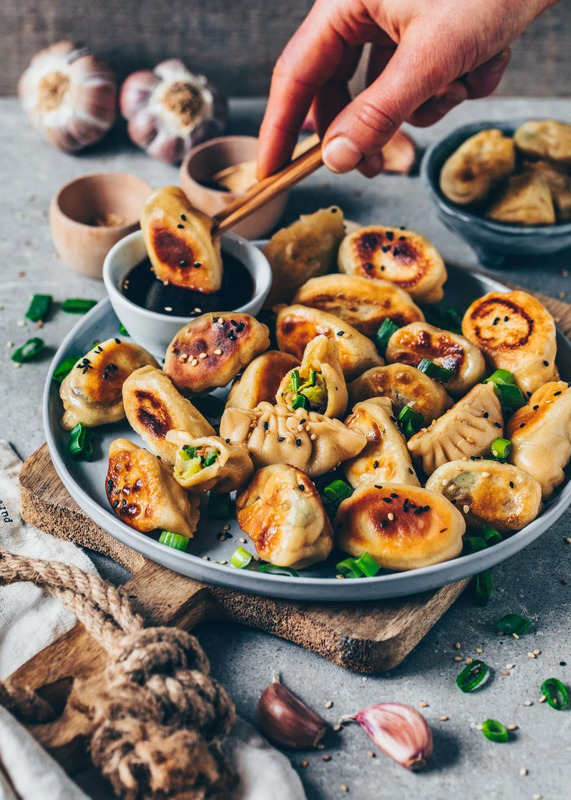 To make these Vegetable Dumplings, you can use store-bought Vegan Gyoza Wrappers, yet they’re so easy to make that I personally prefer making them from scratch. 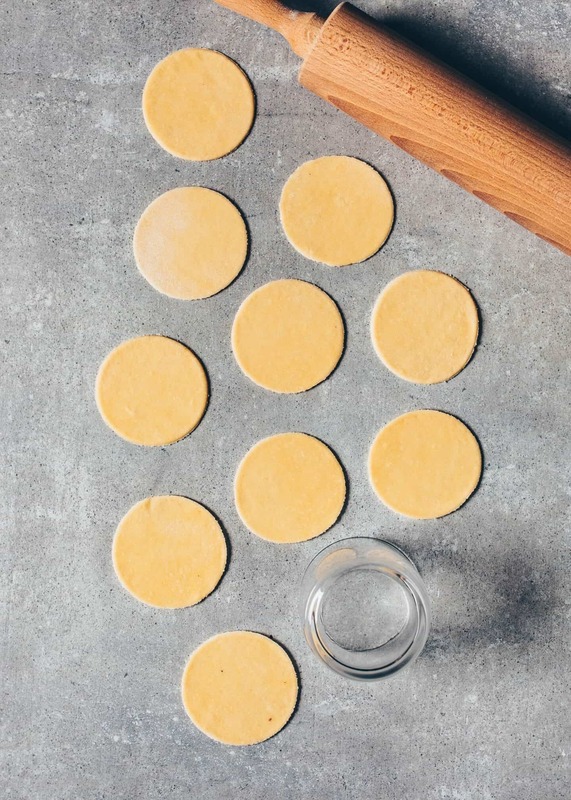 This recipe is pretty similar to my Ravioli Pasta Dough Recipe, with the exception that for Wrappers, you have to roll out the dough thinner. It’s just made of flour, a little salt, and hot water. 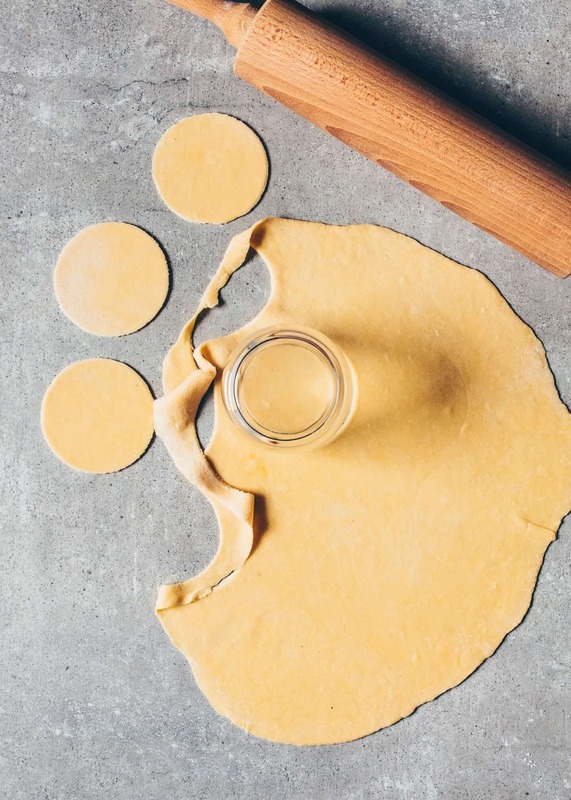 Simply knead to a dough, roll out and cut out circles using a glass or cookie cutter. That’s it! The filling is simple, consisting of only stir-fried vegetables. I used cabbage, carrots, mushrooms, leek, onions, and garlic, plus seasonings. But of course, you can use any veggies you like. If you want to add a plant-based protein source, you could also add tofu, beans, lentils or chickpeas. To make it spicier feel free to add sambal oelek or sriracha sauce. It’s possible that you may have some filling left in the end, but if you’re like me, it’s not such a big deal, because I love snacking while preparing food. Also, remember that vegetables are healthy! 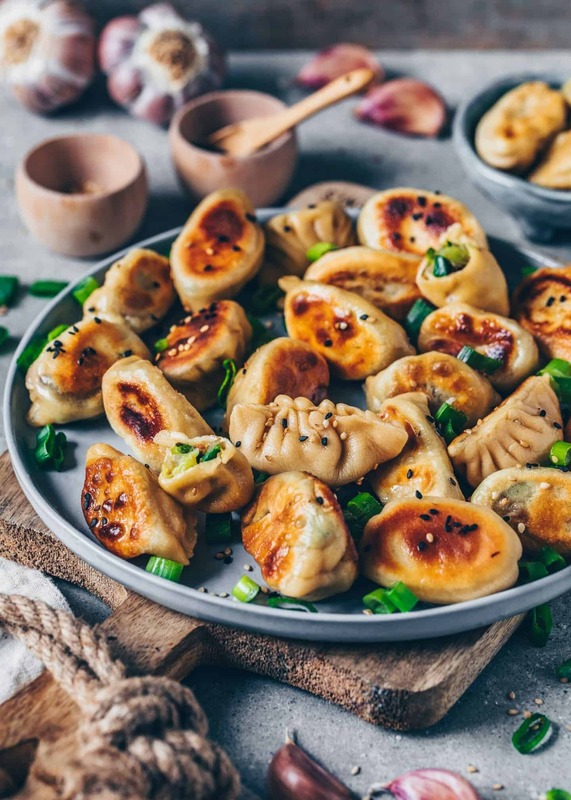 The easiest method of wrapping Vegan Dumplings is just adding the filling into the center of each circle and then folding into a crescent-like Pierogi. Traditional Gyozas have this special hand fan pattern, however, there are many different ways to fold them. I prefer doing it this way you can see in the pictures below. Either I fold both sides together making the hand fan pattern (picture 1), or I fold each side separately and then sealing it together (picture 2). Anyways, no matter how you shape them, they’ll all taste equally delicious. 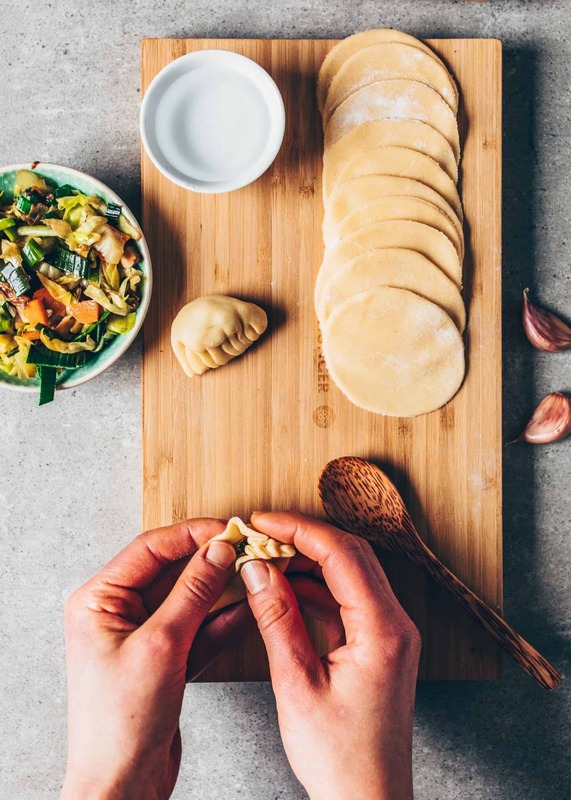 Although it takes a while to fold all of these Vegetable Dumplings, it’s definitely worth it to take the time. 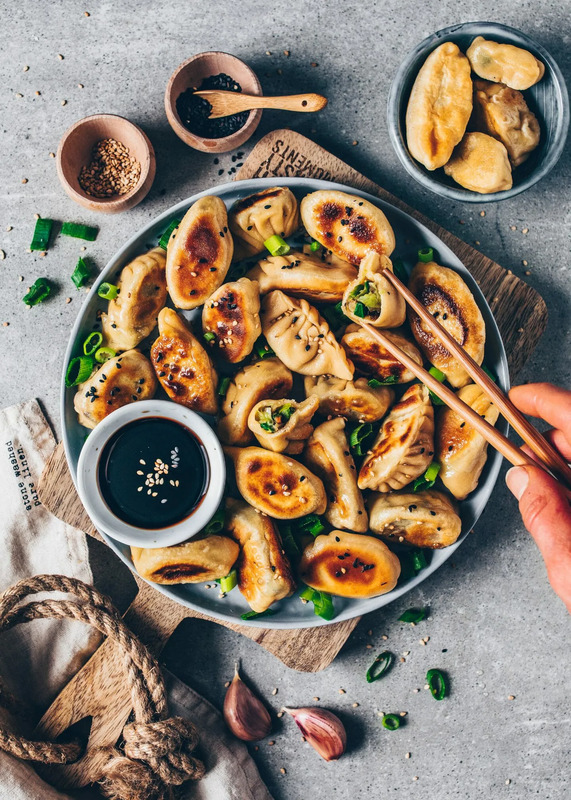 Once you’re finished you will have a batch of tasty Potstickers that you can freeze and cook any time you want to serve them. 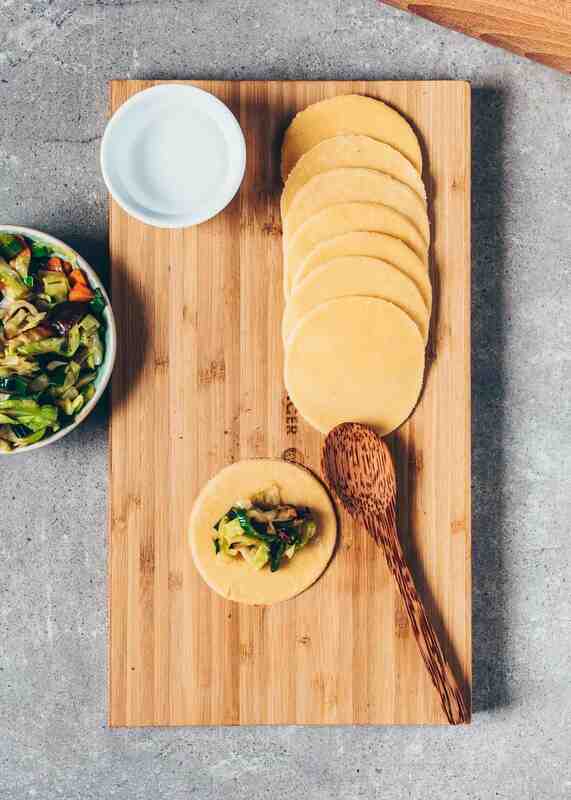 To freeze the uncooked Gyoza, place them in a single layer on a flat surface (f.ex. a baking tray), leaving some space between each to prevent them from sticking. Freeze for 1-2 hours, then transfer to a freezer bag. To serve, simply cook them straight out of the freezer, just steam for 2 minutes longer. There’s no need to defrost them. Perfect as an appetizer or main course! I like Vegetable Dumplings best when they’re softly steamed and the bottom is crispy and pan-fried to a golden brown. When serving them, I make a sweet and sour dipping sauce which comes together in a few seconds. Sprinkling over them with some fresh spring onions and toasted sesame makes for a yummy dish. 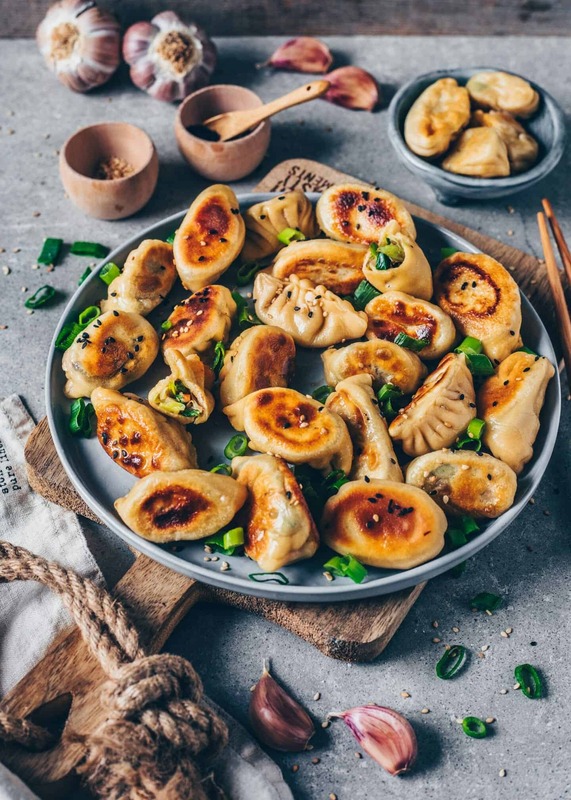 Anyways, you can also serve these Potstickers simply steamed or cooked with a sauce or dip of your choosing. Cut out circles using a glass or cookie cutter (mine is 3-inch wide/ 8cm). Remove the trim, knead it into a ball, and roll it out again to cut out more circles. Finely chop the veggies and heat the oil in a large pan. 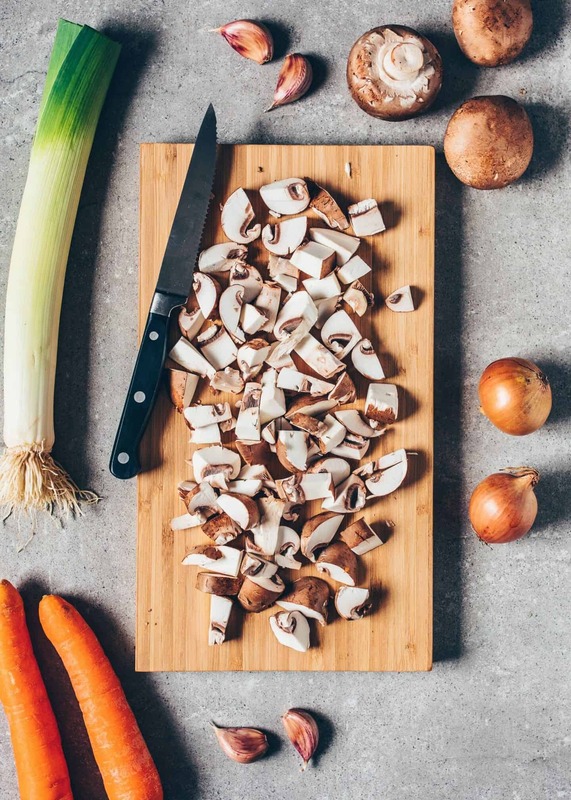 Add the mushrooms, onions, and carrots and fry for 2-3 minutes until lightly browned. 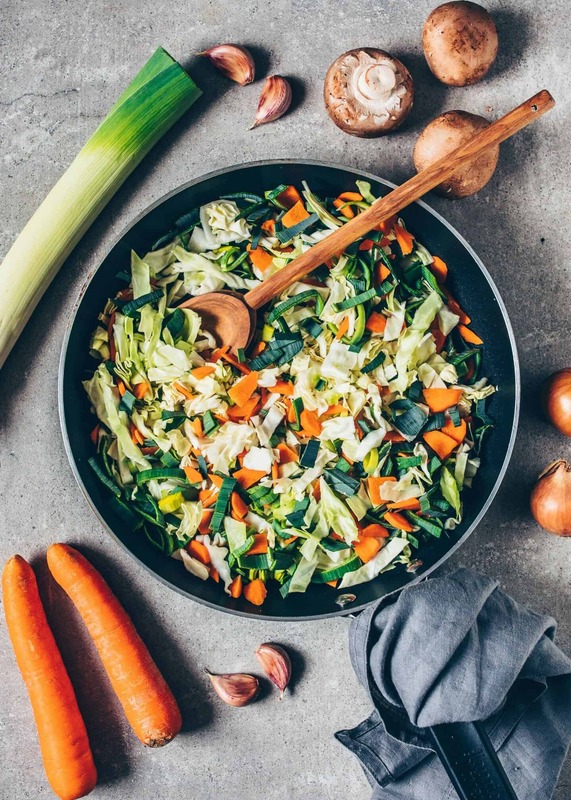 Then add the leek and cabbage with a little salt and cook for further 5-7 minutes, or until veggies are soft and cooked through, stirring occasionally, adding a little water if needed. Add the garlic, ginger, and seasonings and cook for a further minute to combine the flavors. Add 1 heaped teaspoon of filling to the center of the dumpling wrapper. Brush the edges with water and fold the dumpling creating hand fan pattern or as desired (see pictures in the text above), making sure to seal the seams. Repeat until the wrappers are used up. Now you can freeze the uncooked gyoza (see recipe notes*) or cook them. Heat the oil in a pan over medium heat. Add the gyoza and fry for 2-3 minutes or until the bottoms are nicely browned. Pour in about 1/4 cup of water and cover with a lid. Steam for 7-8 minutes or until the water has evaporated. Mix all ingredients for the dipping sauce together. The total amount of Dumplings may vary, depending of the thickness of your Wrappers. 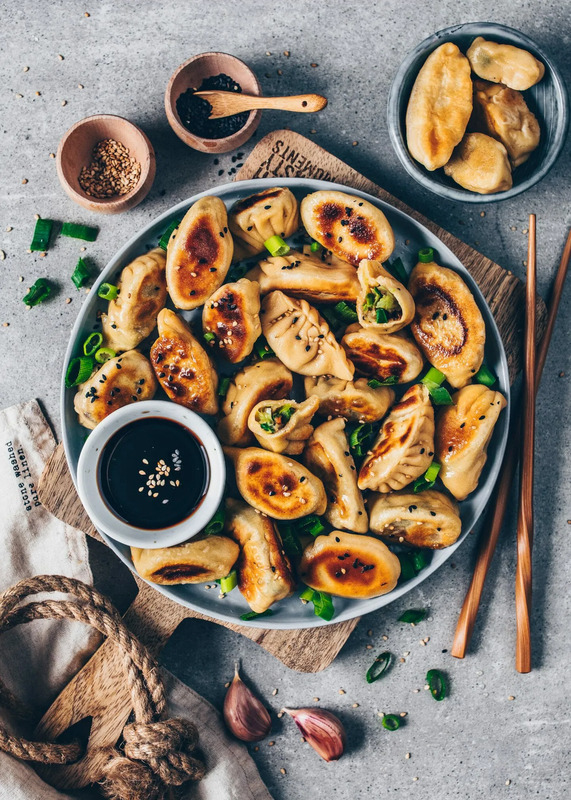 To freeze the Dumpling Wrappers, wrap up an entire stack with cling film, making sure to dust them with cornstarch, and place in the freezer. To use, place the frozen wrappers in the refrigerator until thawed. 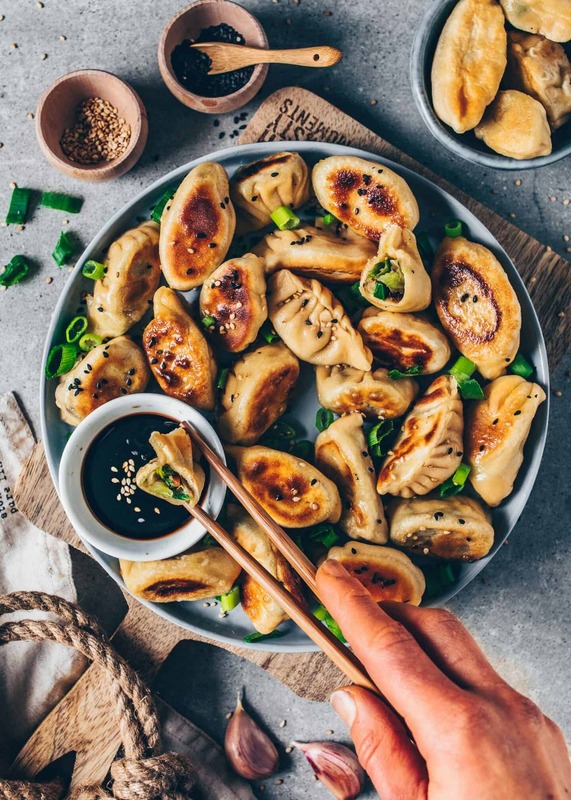 To freeze the uncooked Gyoza, place them in a single layer on a baking tray or board, leaving some space between each to prevent them from sticking. Freeze for 1-2 hours, then transfer to a freezer bag. To serve, simply cook right out of the freezer, just steam them for 2 minutes longer. You don’t need to thaw them. I made these and loved it completely! it’s an amazing recipe, i love it so much and it’s veru easy to make!!! It’s also one of my favorites. These were the most delicious dumplings!! Thank you for an amazing recipe. Would it be possible to bake them or maybe steam them? Soooo lecker. Mein Freund und ich lieben das Rezept. Amazing recipe. So easy and tasted so good! Can’t wait to make more! Excited to try these, I’m halfway through making them but is it 2 1/2 cups of flour or 300ml of flour ? Or am I reading this wrong? Oh right, not sure how I saw ‘ml’ instead. They were delicious! Can’t wait to try some of your other recipes!